If you are a Jamaican living overseas or in a relationship with a Jamaican (man or woman) living outside of areas densely populated by a West Indian/Caribbean migrant community, you will need to learn how to make this bread to survive homesickness. We are not joking. This will make you the gem of your partner’s eye or will make your own eyes fill with water as you break off a piece before it cools and be immediately transposed to your mother’s/granny’s kitchen or the neighbourhood bakery that you were forced to form long lines to get a loaf from every weekend. This is not just flour butter and water. This is not just bread. This is essential expatriate survival tool. If you are not a Jamaican, never mind, if you make this bread and come back and tell us about it, we will crown you honourary Jamaicans because you would have earned the right to cultural citizenship! This recipe is adapted from Enid Donaldson’s “Real Taste of Jamaica.” So here’s to a Real Jamaican Weekend… I say curry goat for dinner and have some of this bread with butter and some chocolate, mint or Milo’ tea’ or a swig of sorrel and smell the Caribbean sea breeze. Add cold water and knead. Form into a ball. Knead for 15-20 minutes and place dough in a greased container. Make sure ball is greased all around. Cover container with a clean, dry towel and place in a warm place for 40minutes, to rise. Remove ball to a lightly floured board. Use rolling pin and shape dough to a rectangular shape. Roll up dough as tightly as possible and shape in to rectangle to fit loaf pans. 12. Tap loaf and if it sounds hollow, leve for five minutes then take it out. (I personally like my loaves a tad lighter than in this pic). « Bring love back in the… kitchen! This makes me feel right at home! What a rich resource! What beautiful I-can-almost taste home photos! Thanks for sharing the recipes and the stories! I’ve seen this picture before on your Face Book page when you made the bread, so don’t cheat, make it again and post us the step by step pics as you usually do! Hahaha! We haven’t got our oven yet so you will have to wait ot you can go ahead and follow the simple procedures if you are eager to try. We have a rice and peas date. I’ve never made my own bread before, but this recipe sounds lovely. This has truly made may day Natalie! Thanks for coming back and sharing your result! Just made this for my hubby, who is from Oracabess, St Mary, Jamaica. It;s a surprise, so i pray it turns out well enough! Wish I could post pics for you! Do email pics to us! We will happily post on our FB fan page! just pulled it from the oven….oh my goodness! it is sooooo good! Better than “Yummy” brand! my daughter and I are gonna end up eating it all before he gets home from owrk to try some! So happy…there are no Carribean markets around here, so my fam in Miami sends us ackee and callaloo…now I can make bread and we get saltfish from a latin market…we are set! BTW Oracabessa is such a beautiful place, we have fond memories of our own from that charming village! He is one lucky man to have you bake this Jamaican favourite for him! Just sent off some pics…my husband is also a chef, and thus, I like to cook for him on his days off! Thanks for sharing the recipe! I can’t wait to try this recipe! My husband is Jamaican and we only get hard dough bread when relatives mail it to us from FL. I would love to surprise him with homemade hard dough bread! I do have one question: Do you use bread flour or all-purpose flour for this recipe? It is all purpose flour in the recipe… and we promise you that if you follow it, it will be absolutely perfect! Do come back and let us know how it goes. Thanks for the prompt reply! I will definitely come back and let you all know how it went! I love to bake as well. I’m from Trinidad and so is my husband. My children love the hard dough bread. They are adults now but I’m trying the recipe myself this morning so I can share this stormy day with the family. Thank you for sharing. Crystal, thanks for coming over and sharing some warm Trini vibes! So happy you will be making for the family. Definitely a treat in the middle of the storm. Do subscribe to us via email (top right of the page) to get the latest posts. No worries…I think I subscribed, joined your tweets, FB….the works! Thank you! Fantastic! Looking forward to seeing your comments! Thanks for your support Crystal! I made this bread over the weekend and ‘attempted’ to surprise my husband. (He noticed rather quickly and ended up helping me knead the dough.) The bread came out very nicely: we’re down to one loaf! Thanks for sharing the recipe! LOVE that hubby came in and helped with the kneading. We have made this by hand and also in a stand mixer and prefer the hand method. It helps when you have extra hands when the dough needs to be kneaded for 15mins! Do subscribe to us via email (top right of the page) to get the latest posts. I am making this bread today. I’m originally from Trinidad, married to a Trinidadian but we enjoy this type of bread occasionally. I’ve made it before from memory passed down from my grandmother (we are a family of bakers). But, this time decided to try your recipe. I will let you know how it comes out. It’s been in the oven about 15 minutes now. Just took it out the oven…took a picture for good memories. Also, I did not want to use all the dough at the same time so I cut two parts off and stored them in the freezer for baking later. This is one of the only breads I’ve tried that actually came out really good. One of the loaves, I put cheese inside of it before I put it in the oven and they are both phenomenal. The kids love it and I will keep this recipe and make my own from now on. THANK YOU!!! The wife relies on her parents to bring her the store bought stuff. It is usually pretty dry. I made this for her last night. Now I’ll have to make it twice a week. It came out fantastic. I’ll serve it up with my jerk pork and rice and peas. I should have been born a Jamaican, the food is sooo much better than what I grew up with. Haggis anyone? I tried this and it turned out PERFECTLY. The key is the time allowed for the dough to rise – 40 minutes – both times – and not 1 hour as in many other recipes. I am from Jamaica, and this is definitely the real deal. The short rising time makes for heavier bread as we are accustomed to in Jamaica. Thanks Enid Donaldson, and thanks to you for posting. I also halved the ingredients – precise measurements – and it works too. I used soft margarine. This warms our heart! We adapted the recipe slightly after baking repeatedly and tested it and we think made it better in taste and texture but we agreed with Enid’s rising time. You are bang on for understanding the reasons why it works 🙂 But question- why would you make just one of these loaves? One loaf made, because I don’t want to look like Louise Bennett!! But I may need to make a large quantity as I am getting a reputation now for this bread. Dear Chef.Compliments of the season to you.Many thanks for your reply on the issue of the Grotto and Raisin Bread, The Coronation Bakery really bakes very good bread even though i have not tasted the grotto bread from that bakery. However i must tell you that i have tasted their Easter bun and it was so nice that i could not stop eating before i got home. and that old time Curry Cow Skin and Beans recipe, and on the jamaican way of cooking Chicken Chop Suey,without the deboneing of the chicken. My girlfriend is Filipino and she just made the best Hardo bread I’ve ever had, no kidding. Nice crust on the outside and soft on the inside. You would’ve sworn that it was brought fresh from the bakery in the middle of Kingston. Thanks to your recipe, she’s made me the happiest Jamaican man ever. I have just made my first hard dough bread. The mix didn’t rise,although left for the recommended time. Anyway just taken out- of the oven,will try it and let you know how it taste. I’m back,yummy! It taste fantastic! Don’t know if my husband will get any! Happy it came out great! It’s important that the dough be left to proof in a warm area. You can place beside stove while the oven is preheating or while you are doing stovetop cooking. I’m a Jamerican (23 trips to Jamaica) and I am in love with harddough bread. My suite case was almost over weight last month because I had two loaf packed in. It would be heaven if I could really make it myself. Still making this unforgettable bread for the wife and kids on a regular bases. There are always requests to bring some from extended family members whenever we gather. It was a pleaser for me to give this comfort food to my sister-in-law while she was on chemotherapy. It was well recieved. Thank you again for posting this recipe. It has been the reason for lots of “Mmmmmmmmmmm’s” and smiles. Joseph, comments like yours is why we do what we do. We believe in the capacity of food to communicate love. Thank you for allowing us to bring happiness to those you care about by actually making our food. Just back from family wedding and trip to Above Rocks where father is from. He and his brother reminisced about their grandfather who was a baker and his “cutthroat” bread…so named for it’s hard crust (the inside they described sounds similar to hard dough). Could the cutthroat be the same except baked differently to obtain the hard crust (we’re talking 50 years ago in a small mountaintop village). Will try your recipe out with an attempt to get the bread to cutthroat status for our next reunion! Am gonna try it, hope it works out well, all those good comments may me feel high well want to try it. Am a jamaican st.elizabeth santa cruz. Hi everyy one. I am greatly into bread baking, and for a long time have wanted to try making the hard dough bread obtainable in good supermarkets and ethnic stores. Trawling the web I find dozens and dozens of ‘recipes’, which really do not basically differ from each other. So. I picked several authentic sounding surces, and set about it. Will someone PLEASE tell me what it is that is not mentioned in the recipes and metheods, so that I can produce the tight, sweetish texture of the real thing! None of the many I have tried turns out any different from ordinary well made white bread. I know I can get a slightly tighter texture by mixing with milk instead of water, but no reipe I found said that. So come on all you Caribbean bakers – clue me up! Have you tried our recipe? Came out great! Give thanks!! Thanks so much for this recipe. Clear, concise, yummy. 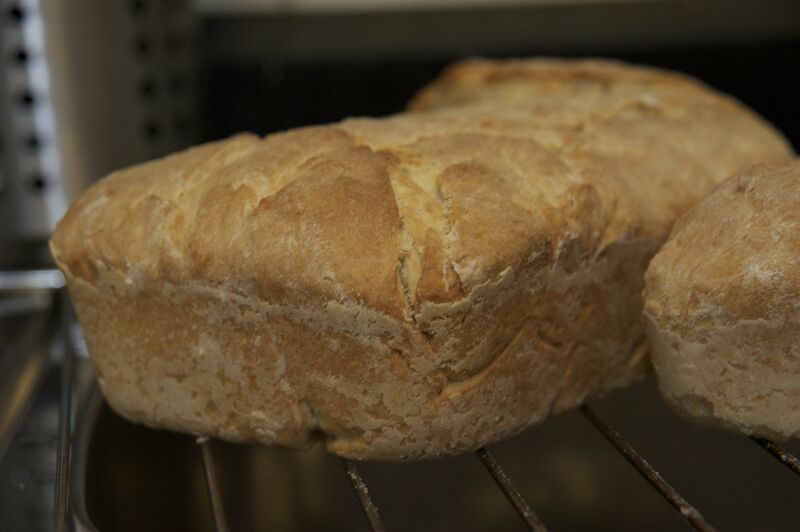 This was my first attempt at homemade bread – mixed and kneaded by hand. I’ve been using a bread machine since June. The bread came out perfect. My only regret was halving the recipe. My husband came in from work and ate half the loaf – 2 peanut butter sandwiches and 1 cheese sandwich. I enjoyed mine with smoked turkey breast. DELICIOUS! Looks like I’ll be baking again tomorrow. BTW, we are Haitian. We expect our honorary Jamaican cards via e-mail. Well done Audrey! Just keep an eye open for the post man! Happy both you and hubby enjoyed it and thanks for sharing your experience! Just made this for the first time and it was on point! I’m PuertoRican, but fell in love with this bread on my visit to Brownstown to spend time with my best friend Corine who lives there. None of the store versions even came close, but this recipe does! And so EASY! I’m going to be making this over and over for my husband and I. Thank you for your awesome bread recipe! I had the bread machine make the dough for me as I do not care for my fingers to get into sticky situations 🙂 Then I pressed it out with my fingers, cut it in two, rolled it up and followed the rest of your instructions. Funny how one side of my oven is hotter than the other. One loaf was done in 25 and the other in 30 :). Way to go Arlene! Good observation about your oven. I too sometimes use our Kitchen Aid when my wrist hurts too much for a dough battering but I do prefer the texture by hand but FRESH homemade bread ‘don’t care’ either way! I made this recipe last weekend, and it turned out absolutely perfect! My family enjoyed the bread so much that my first loaf was finished in 20 minutes. I thank you for your time and help in sharing this Hard Dough Bread recipe. Nadine, your comment brings me LOTS of joy and that’s why I do what I do!Thanks for returning to give your feedback!